SAVE A LIFE Corporation, offers a specific medical training course for Heartsaver Adult CPR and AED training. This course is taught by one of our medically experienced and professionally trained staff. In the AHA/AAOS/ECSI/ASHI Adult CPR Course students will learn how to recognize the signs and symptoms of a heart attack, cardiac arrest, stroke, and choking in adults with use of barrier devices. Facilitates efficient training and testing in the use of automated external defibrillators (AED). Intended Audience: New or renewing students. 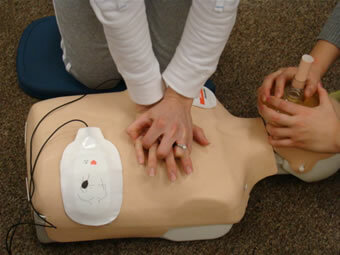 For anyone interested in learning basic life support skills, with hands-on AED training. This meets workplace requirements for CPR and AED training. Students Materials: CPR & AED Textbook.